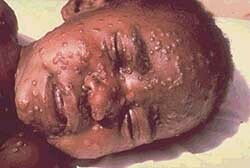 Smallpox was caused by either of two virus variants named Variola major and Variola minor. The deadlier form, V. major, had a mortality rate of 30–35%, while V. minor caused a milder form of disease called alastrim and killed 1-2% of its victims. Symptoms of smallpox included a high fever, head and body aches, malaise, vomiting, and a rash of small red bumps that progressed into sores that could break open and spread the virus (the virus could also be spread via contact with shared items, clothing, and bedding). Long-term side-effects for survivors included the characteristic skin scars. Occasional side effects included blindness due to corneal ulcerations and infertility in male survivors. Smallpox was an entirely human disease — it did not infect any other animal or insect on the planet. Thus, once vaccination eliminated the chances of the virus spreading among the human population, the disease disappeared; in fact, the United States has not vaccinated for smallpox since 1972. Although smallpox was one of the most devastating illnesses in human history, killing more than 300 million people worldwide during the 20th century alone, scientists declared the world free of smallpox in 1979. The disease has been wiped off the face of the earth, except for samples of the virus held in labs in the United States and Russia for research purposes. To this day, smallpox is the only human infectious disease to have been completely eradicated from nature. However, fears remain about the smallpox samples being used as bioweapons.